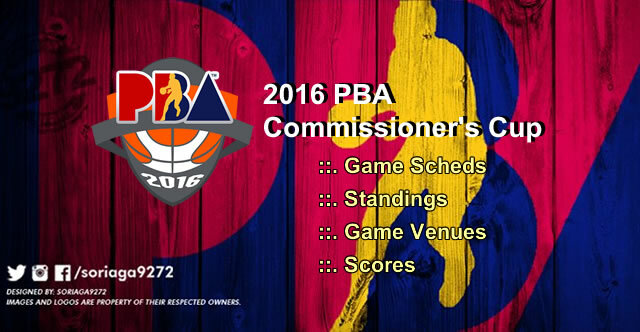 The table below contains the list of the 66 games for the 2016 PBA Commissioner's Cup. Also included on the list are the game's time, date, venue, opposing teams, the final scores, and the current team standings. For the Commissioner's Cup, all teams are allowed to tap an import as a reinforcement. The new team for this conference is the Phoenix Petroleum which replaced the Barako Bull Energy Cola. Other participating old teams are the Alaska Aces, Barangay Ginebra San Miguel, Blackwater Elite, GlobalPort Batang Pier, Mahindra Enforcers, Meralco Bolts, NLEX Road Warriors, Rain or Shine Elasto Painters, Star Hotshots (Purefoods), San Miguel Beermen, and the Talk N Text Tropang Texters. Note: Games 73, 74, 75, & 76 are only of necessary. Notes: Games 81, 82, 83, and 84 are only if necessary. Notes: Games 88, 89 and 90 are only if necessary.